The View-Master is a vintage tool that presents three-dimensional images. 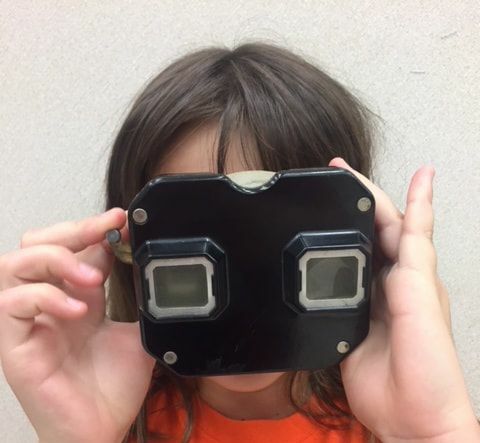 Although the stereoscope had been the chosen source for viewing images for learning and entertainment for decades, the invention of the View-Master meant that people put their stereoscopes aside in favor of a newer form of virtual reality. The basic principal used is the same as the stereoscope: left and right eyes view two photos taken at slightly different angles and see a three-dimensional image. However, the View-Master has a very different mechanical construction. The outer case for this early model, from the 1940s, is molded black Bakelite, a very early type of plastic. The unit is light, compact (approximately 4-1/4” x 3-1/2” x 3”), and easy for a child to handle. In order to operate the View-Master, a person inserts a special circular cardboard reel into a slot. The reel has seven pairs of color photographs (14 pictures in all) that can be rotated by a lever, advancing the photos to align with the left and right eye pieces. Holding the unit to face a light source makes the photos visible. The scenes in our collected reels are from the 1940s and '50s—Kodachrome shots of historic places, scenic beauty, special holidays, famous characters from sports and entertainment, and early scenes from Disneyland. The first View-Master prototype was developed by the Sawyer Photographic Company in 1939. Located in Portland, Oregon, the Sawyer Company mainly produced photo postcards and album sets as souvenirs to tourists but quickly started experimenting with the new Kodachrome color transparency film in different ways. While in development of the first View-Master, the Sawyer Company entered into a partnership with a German organ maker named William Gruber. An avid photographer, Gruber invented a machine that allowed the tiny film images to be mounted on sturdy, round card stock. While the Sawyer Company had great success with their two-dimensional greeting cards, the collaboration with William Gruber produced a viewer that held seven pairs of images. With this new technology and viewed through the newly named View-Master, one could see images that where three dimensional and appeared near and real to the viewer. 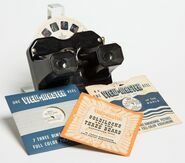 Although the stereoscope had been the chosen source for viewing images for learning and entertainment for decades, the View-Master became the newest form of virtual reality. ​View-Master configurations have changed over time but are still in use as popular devices for learning and enjoyment. 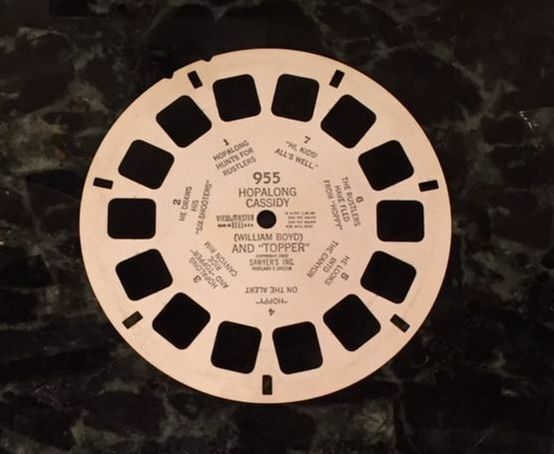 This photo shows a View-Master reel. This one shares scenes from Hopalong Cassidy, a popular television show about a heroic cowboy that was popular in the 1950s. In this photo a young student is using the View-Master. Note the student's finger on the lever (on our left). The lever is used to advance the frames.